Pye Factory,fridge assembly line..1971..15.04.1971..04.15.1971..15th April 1971..The Pye factory which manufactured electrical appliances closed its doors in 1985. At the peak it Pye employed 1200 people and was the largest employer in the Dundrum area. Dundrum bowl was built on the Pye site when the factory closed, it too had its problems and closed in the early 90s due to flooding. 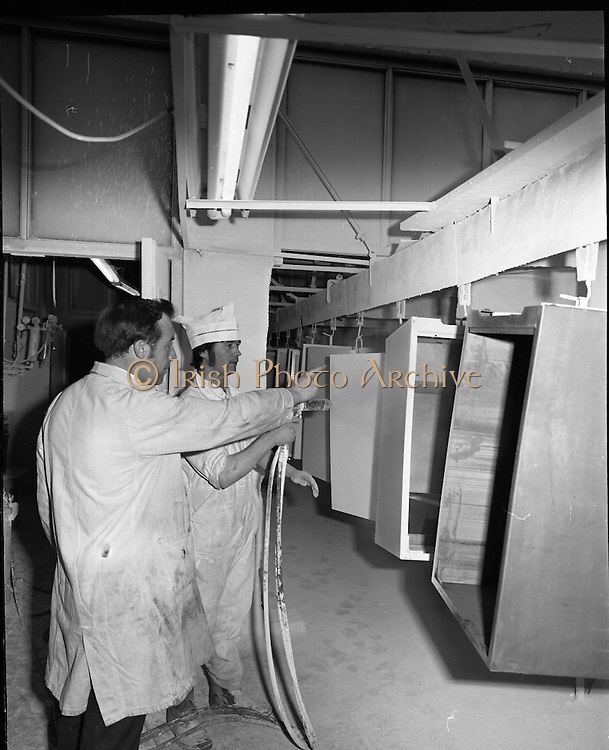 on the site now stands the Dundrum Shopping centre which is now the centrepoint of Dundrum town centre..Image shows fridge casings moving along the assembly line. The units are spray coated with the required finish.The supervisor is seen instructing the spray painter.